Using Azelaic Acid For Hair Loss: Worth a Try? Using Azelaic Acid For Hair Loss: Worth a Try? →Using Azelaic Acid For Hair Loss: Worth a Try? Many peoples response to hearing about the possibility of using azelaic acid for hair loss, is one of confusion. Firstly, how can an acid help with hair loss? Secondly, what's the evidence that using azelaic acid ​for hair loss could actually work? Well, it may surprise you to know that azelaic acid is already present in many hair loss formulas. For example, many brands of minoxidil-based hair growth products. Many of these contain 5% azelaic acid and sometimes more. So what is the role of azelaic acid in preventing hair loss, and could using it on its own produce, or reverse hair loss just as effectively as expensive products? ​Using Minoxidil (Rogaine) For Beard Growth: Just A Myth? Azelaic acid is also known as nonanedioic acid, a composition of nine carbons. It is used to make a range of products, including pharmaceuticals and fragrances. So it is commonly used, and safe to use, within the context of application to the body. Although regulated for pharmacological use, the FDA states that use of azelaic acid can have physiological effects. These are decreased protein synthesis, and decreased sebaceous gland activity. However, generally this acid is beneficial to the skin and can reduce damage. Several brands of topical skin creams, used to treat acne and rosacea that are primarily constructed from azelaic acid are available, including the USA brand name Azlex. So it's clear that azelaic acid is widely used in skin products, and can be beneficial to the skin, but what is the mechanism in it that makes it suitable for hair restoration products? ​How Can Azelaic Acid Stop Hair Loss? The reason that azelaic acid is included in several hair loss products is that some studies have found that it can play a role in stopping hair loss, particularly male pattern baldness. Male pattern baldness is caused when testosterone is converted into DHT. Because of its potency, DHT is, therefore, a key body response that creates ongoing hair loss. DHT is created when testosterone is converted into it, via a mechanism involving the enzyme 5-alpha reductase. Azelaic acid has been reputed to partly, and in some studies completely, inhibit 5-alpha reductase activity in converting testosterone to DHT. ​Evidence Using Azelaic Acid For Hair Loss Works? In terms of evidence, the main way of seeing if azelaic acid can be beneficial for stopping hair loss, is to look at existing scientific studies into its effects on male pattern baldness, and related problems. A British Journal of Dermatology study, first published in 1988, tested the effects of a combination of zinc and azelaic acid on the activity in the skin of the steroid 5-alpha reductase. The research team concluded that a concentration of 3 millimoles per liter, the combination of zinc and azelaic acid could completely inhibit the activity of that enzyme. Even at lower concentrations, when the acid and zinc were mixed with vitamin B6, up to 90% inhibition still occurred. So from this early realization that azelaic acid, on its own, or in combination with zinc, could be a potential solution to androgen hair loss, other studies took place. One pilot study​ recruited 31 people who had the condition alopecia areata. This is a condition where patchy, immune-mediated hair loss takes place. In this study, one group spent 20 weeks applying a formulation of 20% azelaic acid cream, while the other applied a 0.5% solution of anthralin cream, an already tested and proven treatment for alopecia areata. Therefore, this study had a good baseline, and if azelaic acid matched it, then the conclusion could only mean that this acid has the same capability. At the end of this time period, the lead authors, Dr Samaz and Dr Arican, undertook clinical examinations in comparison, on the subjects of the study. They found that both groups showed positive results, with average terminal regrowth scores above 1.0, which represented positive response. In fact, a complete positive response was observed in 53.3% of the study participants who applied azelaic acid, compared to 56.2% of the participants who used anthralin cream. The inescapable conclusion from these studies, and subsequent ones, is that the potential for Azelaic acid, on its own, or in conjunction with vitamin B6 and zinc, to inhibit the ability of 5-alpha reductase turning testosterone into DHT, is a strong one. Before starting to experiment with azelaic acid for hair loss, it's essential that you check if it is contained within any existing hair loss products use. As previously mentioned, many minoxidil-based products also contain up to 15% azelaic acid. In addition, some topical scalp creams and conditioners, especially those formulated for alopecia, also contain a quantity of azelaic acid. But if you are not already using a hair loss treatment, then it is low risk, and high potential benefit, to purchase a topical azelaic acid product to use on your scalp. You can buy cream/gel solutions containing varying percentages of azelaic acid for a very reasonable price. This combined with zinc and vitamin B6 could be very cheap and potentially effective hair loss treatment, if used in moderation. HAIR REGROWTH TREATMENT FOR MEN AND WOMEN! 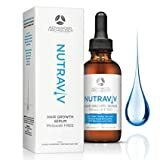 WITH TOPICAL HERBS AND VITAMINS - WITHOUT CHEMICALS: Nutraviv hair growth serum scalp serum is a completely unique natural formula contains NO Minoxidil, NO Propylene Glycol, No Rogain, and No Harsh Chemicals of any kind. It does contain natural DHT blockers, B vitamins, scalp healing herbs, and essential oil safe for ALL hair types. DEVELOPED IN TOP USA HAIR LOSS TREATMENTS CENTER: The Advanced Trichology line was developed in our own top-rated hair loss treatment centers. The Nutraviv Topical Scalp Serum has been scientifically tested in our clinics for those who wanted a non-minoxidil alternative that really works. The Nutraviv hair growth serum uses a proprietary formula that has already shown amazing results for women and men. YOU WILL NOTICE THE DIFFERENCE, HAIR GROWTH PRODUCTS MADE IN USA, QUALITY AND CERTIFIED PURE, MADE OTC FDA Approved Manufacturer. Independent Testing. cGMP, Free of Gluten, Free of Wheat, and Vegetarian, No Animal Testing. Does NOT weigh your hair down like other formulas. Nutraviv works by blocking DHT, stimulating hair growth by herbs and vitamins, and fights scalp conditions with essential fats. So generally, it's probably best to try this acid by adding it to a normal hair maintenance regime, rather than replacing an existing treatment you might already be using. You should not substitute minoxidil for it, for example. In terms of application, it's simply a case of squeezing a reasonable amount onto your hands, and then gently working it through the hair, so that it is worked slowly into the scalp. However, it's probably best to keep the concentration low, 10% or less. It could be mixed with another solution, like a carrier oil, in order to both dilute the azelaic acid solution, and improve its absorption in the skin. Let's finish this positive piece on using azelaic the hair loss with a warning though. The concentrations are low in professional hair loss products for a reason. DHT blockers can have a lot of side effects, and if too much is absorbed, this could cause lots of unforeseen mental and physical issues. So it's best to start experimenting with a low percentage, and to wash the solution of after a short space of time. Certainly don't cover it with a cap and leave it for hours, as the absorption could be too high.